ROLLING MEADOWS, IL., USA – June 19, 2013 – The 2013 ICMA Expo, also known as, the ICMA Card Manufacturing and Personalization Expo, was a big hit last week at the Washington Marriott Wardman Park in Washington, D.C.. The International Card Manufacturing Association (ICMA), hosts this annual event for industry members to connect with colleagues and clients all over the world. Spartanics was amongst the list of industry leaders exhibiting and networking at the 2013 ICMA Expo. Over the course of several days, Spartanics participated in several educational discussions regarding the card manufacturing industry and deliberated with other industry leaders on topics pertaining to the manufacturing and production of cards, card applications and substrates, best practices and the future of the card industry. “The ICMA Expo was excellent. We were able to introduce our sheet fed hot stamping system along with our plans for a single card, hot stamping system for CR80 and loyalty cards,” stated Rick Roberts, Spartanics National Sales Manager. 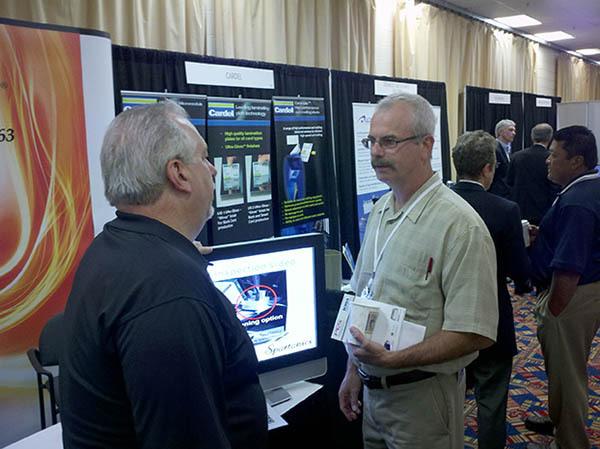 The ICMA has been providing networking and educational opportunities to the card manufacturing industry for 25 years. ICMA is a non-profit organization with members in over 40 countries through the world. In addition to the annual ICMA Expo, the organization hosts several industry events throughout the year. For all sales and product inquiries please contact Mike Bacon, VP of Sales & Marketing, Spartanics, (847) 394 5700, FAX (847) 394 0409, Email: sales@spartanics.com.